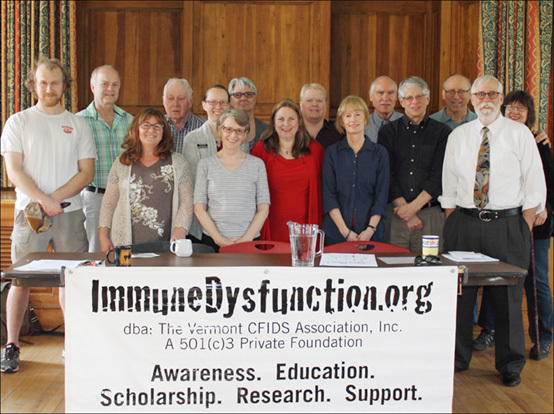 The goals of the Vermont CFIDS Association are to: (1) raise public awareness of Chronic Fatigue Immune Dysfunction Syndrome (CFIDS), (2) support and advocate for Vermonters who suffer the debilitating symptoms of this and related disorders, and (3) facilitate the education of patients, families, healthcare providers and primary care physicians in order to validate and establish a recognized and acceptable protocol for the diagnosis and treatment of CFIDS. printed, bound and sent to the person of your choice: Click Here. Vermont's History, "The Jim Boyce Story"
Jim Boyce is the original founder of the Vermont CFIDS Association. "The pain is crazy and trying to find a pain management Dr. that also specializes in Pancreatic Disease which I have. I have been in the ER more than I can count on my fingers. Procedures almost every 2-3 months to put stents in my pancreatic valve. I keep getting scar tissue build up and they do not understand why. Also when I was on Oncology last year for two weeks they noticed I have three blood clots on my stomach, an anursim on my valve to the stomach which is unoperaable, Liver damage, Inflammation of the spleen, liver, lungs, and stomach. Life is fantastic especially since it is not related to alcohol or drugs. Maybe if I did do all that while growing up during my early years I would be healthy. LOL Never too late to start. Just kidding." Rik Carlson was afflicted with a sudden onset case of Mayalgic Encephalomyelitis on January 2, 1995 and 18 months later was passed the baton to form the VT CFIDS Association, now ImmuneDysfunction.org. He wrote the book We're Not in Kansas Anymore: Chronic Fatigue Syndrome and the Politics of Disease and has written numerous essays about Chronic Fatigue Syndrome. In 2006 he testified before the Chronic Fatigue Syndrome Advisory Committee in Washington D.C. In 2009 he was part of the published Obama Biden Transition Team report on Health Care in America. In conjunction with Michael Thurston, Rik directed the film Invisible. He lives in Burlington with his wife Barbara, and their cats. Their son, David, is a Marine Corps Veteran and works with Veteran's Services at the University of Vermont. In conjunction with sculptor Steve Larrabee and property owner Melinda Moulton, Rik is responsible for The Flying Monkeys of Burlington, Vermont. Lainey Rappaport is the Secretary of the VT CFIDS Association. She takes notes at the meetings and puts ads out for our support group. She has been to doctors in Vermont, NH, MA, CA and FL and understands the need to pace ourselves, have a good diet, and take supplements. She has tried yoga, meditation, pilates, warm pool, hot tubs, massage and accupunture. She is a teacher, but not full time. She does shows as Lainey, The Frog Lady, and was recognized by the city. She is a Notary, is on the board of the Register of Voters and is Vice-President of the stamp club. Lainey is a Justice of the Peace in Burlington, Vermont. You can call or write anytime. Laineyrapp@yahoo.com 660-4817. Director of Public Policy, P.A.N.D.O.R.A., Inc.
Dr. Friedman developed an interest in Chronic Fatigue Syndrome (CFS) when his daughter became ill with CFS/Fibromyalgia in the early 1990s. He is the author of the lead chapter of the New Jersey Consensus Manual for the Primary Care and Management of Chronic Fatigue Syndrome, and co-author of two additional chapters. The manual has been translated into both in Spanish and Japanese. The manual is also an official resource for physicians in the State of Vermont available in hard copy through the Department of Health of the State of Vermont. Dr. Friedman served a more-than three-year term on the Chronic Fatigue Syndrome Advisory Committee (CFSAC), a federal Advisory Committee that advises the U.S. Secretary of Health on how proceed with the difficult and complex issues of Chronic Fatigue Syndrome. Dr. Friedman served on both the Education and Research Subcommittees of the CFSAC. He is the author of a research subcommittee report entitled, Fish or War, which served as the source for many of the recommendations submitted to the U.S. Secretary of Health by the advisory committee. Dr. Friedman serves on the Board of the New Jersey Chronic Fatigue Syndrome Association (NJCFSA) and is chair of its Medical Student Scholarship Committee. NJCFSA awards a yearly scholarship to one medical student who writes an award-winning essay about CFS. After serving on the Federal Advisory Committee, Dr. Friedman joined P.A.N.D.O.R.A., and serves as its Secretary and Chair of Public Policy. P.A.N.D.O.R.A. has just announced that it is creating medical student scholarships modeled after the NJCFSA CFS scholarship. The Dr. Kenneth Friedman Award is being given to the VT CFIDS Association for a medical student scholarship in the State of Vermont. Dr. Friedman serves as the current Chair of Membership of the International Association for Chronic Fatigue Syndrome/ME (IACFS/ME) and as an adviser to a new, international, one stop shopping website for CFS patients and their caregivers named cfsKnowledgeBase.com. Holly Smith. I am a 51 yr old woman, living with my boyfriend, Jeff, of 10 years. I have one son, Joe, age 22. Before I became ill with fibromyalgia I was a Workers' Compensation claim adjuster. I processed claims for injured workers by investigating each claim. I would take telephone recorded interviews from the injured worker, interview the employer, all the doctors who treated the worker and the worker's attorney. I was living in New York State at the time and all claims were reviewed by the NYS Workers' Compensation Board for following its laws. It was a very stressful job and, I believe, part of the reason for my onset of fibro. I began having back pain approximately one year after the birth of my son, which was 1987. My back pain continued to worsen and I, like so many others, treated with every kind of doctor I could find. None could come up with a definitive diagnosis except for soft tissue pain. I also endured every kind of diagnostic test available, again with no new diagnosis. My pain moved into my neck and shoulders, aggravated no doubt by sitting at a computer all day. My stomach began to bother me and was diagnosed by a gastroenterologist with Irritible Bowel Syndrome. I began having marital problems around 1996 and along with that came the diagnosis of depression. I treated with medication and therapy. Then came the fibro fog. That was the icing on the cake as far as my ability to work. I would go out on short term disability for a few weeks, think I was better, and would go back to work. I would work a few weeks but I was no better. I went in and out of work 2 more times with no success. I was just not able to keep up with my work. I was finding myself doing things that I had already done a day or two before. I could not remember phone conversations I had had a day or two before. I wrote EVERYTHING down but still found myself to be too confused to do my work well. The hardest part about this was that I was told by every manager I had worked for in the past what a great worker I was and always received excellent reviews. I had worked my way up to a salary that I never expected I would earn. My primary care physician finally diagnosed me with fibro in 2001. I continued to work, suffering every day wondering if I was going to make it through. In March of 2004 I had to quit work for good. I applied for SSDI on my own and was rejected. The attorney I retained told me that was not unusual. He filed for me immediately afterwards and my claim was accepted. Since then I have researched fibro as much as I can and between taking several medications, several supplements and light exercise, I have come to where I am now. I met Lainey at a different meeting for the disabled and the rest, they say, is history. My name is Lell Forehand and in "my other life" prior to CFIDS (which started in 1984), I was an energetic person, enjoying my life as a Mom and School Psychologist. Our family activities centered on hiking, camping, biking, etc. I also enjoyed long walks and swimming laps about 4 times a week. Well, all that ended one day when I noticed that after swimming my usual 40 laps one day, my legs felt like putty....a new feeling. It also transferred to walking, etc. To make a long story short, after 5 years of seeing no less than 25 specialists all over the US, I was diagnosed with CFIDS. I had a diagnosis but no treatment. I also developed new symptoms like profound fatigue unrelated to exercise and a foggy, spaced out feeling. It is not a feeling that I could describe as I have never had this kind of fatigue in my life. It really is not fatigue. There should be another word....profound exhaustion, mono-like feeling?????? I don't know.....Well, anyway, after trying to continue working on various toned down schedules, I was forced to quit my job as a School Psychologist and went on "aggressive rest therapy." It helped a little but I became very despondent. Since that time, I have continued not to work and try to "do what I can" each day. (I saw a psychologist to help me to learn to cope with a chronic illness.) I have also tried through the years MANY "alternative" treatments and a lot of money went down the drain. It is the hardest thing in my life thus far that I have had to deal with and I had dealt with a lot before CFIDS. So that is the short version of my story. Today, I continue to read about CFIDS, research and hope that a treatment which will make a difference will happen in my lifetime. However, I do not wait for that. I live the best that I can with the energy that I have and try to focus on "what I can do, not on what I can't." However, I contacted Rik Carlson along with some of the other members and Rik sent a "buddy list" for me. That was a live saver as well and those were the first people I contacted when we arrived. Several of us had lunch together and from meeting those people, I, at least, had some contacts for those times when you need information or just need to talk to someone who truly understands. Now, thanks to Rik and others, the group is alive more than ever and is venturing into uncharted territory with the scholarship program, etc. I feel fortunate to be here and to be a part of people who really want to "make a difference." Thanks to all of you here who are truly going the extra mile and I plan to join in and help to the extent that I can. PS The picture to the left, is of myself and my granddaughter, Kathleen. We are trying on some of my Mother's "hats" which we found while cleaning out my parents' home. Notice, I am sitting down but enjoying "being" with her...something I had to learn. Arlen Brownstein MS ND,... received her undergraduate education at the University of California at Berkeley. She then received a Masters in Nutrition at the University of Connecticut. In 1983, she graduated from Bastyr University with a doctorate in Naturopathic Medicine. She now practices in Marin County California with an emphasis on Neuroendocrine balancing. Dr. Brownstein has co-authored two books: Rosacia, Your Self Help Guide and Natural Relief for Anxiety. She is of continued support to Rik Carlson throughout his stages of recovery. For decades, Dr. Brownstein has rescued homeless kittens, nursed them to health, and prepared them for adoption. Cynthia Johnson's health changed forever with a bout of mono in August 2000, at the age of 17, just before the start of a rigorous college program. She had a second bout of mono in April of 2002. She had an understanding doctor at the college who treated her wide range of symptoms from attention and concentration difficulty to pain. At the time, the only way he could describe it was "chronic mono." During that time, she tried various prescriptions to keep her going. There really wasn't anything that would relieve the fatigue. She got an official diagnosis of CFS in April of 2005 (even though the symptoms had started in 2000). She thought that napping in between college classes, even for hours at a time, was normal until she realized it was essential for her health. Entering the workforce for more than a summer left her frustrated. She couldn't figure out a routine to hide her fatigue from others. It was disturbing for her to have such physical and mental weakness around others, which made it hard to be as productive and social as she would have liked, both on and off the job. The last thing she wanted was for her health to affect her work. The times she was social didn't necessarily always go so well either. The difference between her energy levels and that of other 20 somethings was enormous. It was difficult for her to find understanding people, but those individuals that were understanding she treasured. She also found that the person she related to the most in her church was in her 70s. She tried reduced work schedules, but found it very hard to have security in that when managers changed and expectations changed. She now does warm water pool therapy, B12 shots and various supplements, but is off the prescription medications. Her email is cynthia.in.vermont@gmail.com. John Higgins. I have always had high energy, but beginning October 2004 I had unusual fatigue and needed much sleep. These fatigue attacks were intermittent and continued into 2006. In May 2006 my condition suddenly became much worse, and I spent most of spring and summer 2006 in bed. In December 2006 I went to Mayo Clinic in Rochester, but they offered no help or diagnosis for my fatigue. In January 2007 I changed by chance to a primary care physician who knew about CFIDS/CFS and diagnosed me as having that syndrome, based on my having five of the classical symptoms and on blood test results. Her approach was to boost the immune system with diet and nutritional supplements. She said there was no medication specific to CFS. From February 2007 to the present time I improved greatly on average, but my condition went up and down. I could feel much better for two weeks or two months, then relapse and have no energy for two weeks to two months. Even when I was feeling well, I never had the energy that I had before 2004. After being diagnosed with CFIDS/CFS I remembered that my condition had started with a "flu-like" episode, and had followed a stressfull period. Again in April 2006 I had a time of stress (extreme discomfort for a month due to a skin rash) followed by another "flu-like" episode in May 2006, which left me sick and exhausted for eight months. I still have CFIDS/CFS and the intensity of symptoms can vary from light to severe over time. Victoria Brown I am a Red Hatter and my granddaughter loves dressing up when she comes to visit. Here we share a Red Hat moment on my screen porch. I was diagnosed in 1999 at the Mayo Clinic. I was lucky enough to get a new PCP after almost a year of tests, scans, scopes, and so much bloodwork that I felt like a pin cushion. No one put all my symptoms together until my new PCP said to tell him what was wrong. After my littany of symptoms, he asked a few questions and said I had CFS. He said, "It's not life threatening. It's just life changing." What an understatement. My life has been turned upside down and inside out. I have tried every diet, every supplement, acupuncture, massage, meditation, yoga, and a lot of things I've forgotten. Nothing helps. I take vitamins and prescription drugs that take care of some of my symptoms. Nothing gives me any energy. Rest is the only thing that helps. The worst part of CFS is the severe cognitive impairment it has given me. I had five hours of psychological testing to satisfy the disability people. When I read the report, I sobbed. My IQ was estimated at 82. My SAT score was 1575 out of 1600. I was on the dean's list in college. How could this be happening to me. I've read that the SCI is exactly like the early stages of Alheimer's. My dad had Alzheimer's and I get glimpses of how he must have felt and what he experienced. When you go from scoring 800 on the verbal part of the SAT to not knowing how to spell "loop" it is very distressing. pulled me up after a fall and she lets me hold on to her to steady myself. Bugsy is my emotional support dog. He is next to me in bed. He looks at me with big brown eyes filled with love and concern. The warmth from his little body eases my pain.